MADRID -- Gamesa Corp., the Spanish wind-turbine maker with factories from China to Brazil, plans to grab a share of the market for electric-car charging as use of the low-emission vehicles expands. The company is using spare capacity at a turbine converter plant in Valencia to produce car-charging stations, Business Development Director David Mesonero said on Tuesday. Last month, Gamesa ﻿Corp. Tecnologica SA bought 20 percent of Madrid-based technology company N2S to gain software that is used to monitor power use by EVs. 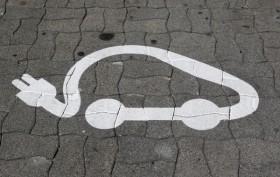 Sales of EVs in Spain may reach 5,000 in 2012 from less than 200 in 2011 as rental companies and fleet managers add models, Mesonero said. The N2S deal is part of a plan to broaden the product range in areas where Gamesa's technology allows it to compete, he said in an interview in Madrid. "Gamesa has industrial capacity we can't ignore. The idea is to have synergies from the first minute." Profit at the manufacturer, based in Zamudio near Bilbao, probably rose about 27 percent to 63.5 million euros ($81.2 million) last year, according to the median estimate of 11 analysts surveyed by Bloomberg. The stock fell 44 percent as Chinese competitors Sinovel Wind Group Co. and Xinjiang Goldwind Science & Technology Co. expanded globally. Since taking charge of the company in 2009, CEO Jorge Calvet has given up market share in turbine production in order to preserve profitability and avoid the price cuts that have forced larger rival Vestas Wind Systems A/S to slash jobs. Analyst estimates show that Vestas probably lost about 41 million euros last year. Gamesa bought the N2S stake for as much as 5 million euros, Mesonero said. The software company, valued at about 15 million euros in the acquisition, is targeting a valuation of 100 million euros within five years and is studying an initial public offering, he added. As well as monitoring vehicle power use, N2S's software can analyze consumption at factories and office buildings and recommend ways to help clients cut their power bills. Gamesa is offering the software to clients bundled with its charging-station product. Gamesa can afford to wait for the electric-vehicle market to develop because it produces the charging stations using spare capacity that's already been amortized, Mesonero said. "There's going to be a very fast take-off for electric vehicles," he said. "The question is, when? We can afford to wait."